Leading Holocaust scholars have refuted a new book’s claim to have uncovered evidence that President Franklin D. Roosevelt tried to help Jewish refugees from Nazism in the 1930s. The book, Refugees and Rescue: The Diaries and Papers of James G. McDonald 1933-1945, edited by Richard Breitman, Severin Hochberg, and Barbara McDonald Stewart, was published in May by the United States Holocaust Memorial Museum and Indiana University Press. The book claims to “reveal” FDR’s interest in settling large numbers of Jewish refugees in Africa or Latin America in the 1930s. Prof. Henry Feingold, who wrote extensively on the 1930s resettlement schemes in his book The Politics of Rescue, issued this statement to the Wyman Institute this week:haven for Europe’s Jews, but never took serious steps to make it happen. 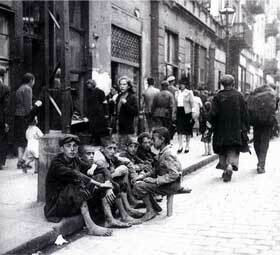 Jewish children in the Warsaw Ghetto, 1941. President Roosevelt claimed to be interested in finding a haven for Europe’s Jews, but never took serious steps to make it happen. “President Roosevelt considered himself a nation-builder –even to the point of falsely taking credit for writing the constitution of Haiti, in order to show his impact on history. His own administration had an agency that resettled large numbers of farmers from the Dust Bowl to Alaska and other undeveloped regions. “There was no financial or political cost in having experts research all sorts of tropical regions and dozens of other remote locations where Jews might theoretically be settled. But when it came to projects that actually had some practical potential, such as Alaska, he was unwilling to cross swords with restrictionists who did not want refugees coming to American territory. * The resettlement projects cited by Breitman and Hochberg were actually revealed in other books many years ago, including Henry Feingold’s The Politics of Rescue (1970), David Wyman’s Paper Walls (1968), Haim Genizi’s American Apathy (1983), and Prof. Breitman’s own 1987 book, American Refugee Policy and European Jewry (coauthored by Alan Kraut). * James McDonald, who is the subject of the new book, himself repeatedly pressed Roosevelt to raise money for the refugees–but FDR never did so. By late 1939, McDonald lost faith in Roosevelt’s promise. * The book erroneously gives FDR credit for combining the German and Austrian quotas, and for initiating the 1938 Evian refugee conference, when in fact State Department officials initiated those steps. * New research by other scholars has revealed new information which reflects badly on the Roosevelt administration with regard to the Jewish refugee issue. The forthcoming book The Third Reich in the Ivory Tower: Complicity and Conflict on American Campuses, by Prof. Stephen Norwood, reveals that U.S. consular officials abroad obstructed efforts by American universities to bring European refugee students to their campuses. Two recent books about settling Jewish refugees in the Dominican Republic reveal that “the State Department’s hostility and obstructionism” played a more significant role in undermining that project than previously known. 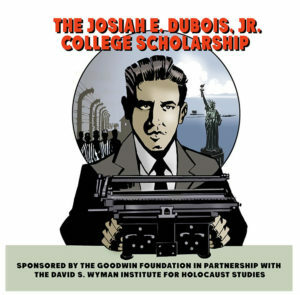 The books are Tropical Zion: General Trujillo, FDR, and the Jews of Sosua (Duke University Press, 2009), by Prof. Allen Wells, and Dominican Haven: The Jewish Refugee Settlement in Sosua, 1940-1945 (Museum of Jewish Heritage, 2008), by Prof. Marion A. Kaplan.